In the near future, one corporation, Blackstone Technologies, has changed the world: no disasters, no poverty, and life-altering technology. Blackstone has the impunity to destroy—or create—as it sees fit. Infinity “Finn” Blackstone is the seventeen-year-old daughter of Blackstone’s reclusive CEO—but she’s never even met him. When disturbing dreams about a past she doesn’t remember begin to torment her, Finn knows there’s only one person who can provide answers: her father. After Finn and an elite group of peers are invited to Blackstone’s top-secret HQ, Finn realizes she may have a chance to confront her father. But when a highly sophisticated company AI morphs into a killing machine, the trip descends into chaos. Trapped inside shape-shifting walls, Finn and her friends are at the mercy of an all-seeing intelligence that will destroy everything to get to her. With no hope of help, Finn’s dream-memories may be the only chance of survival. But will she remember in time to save her own life and the lives of those around her? I take my eyes off Ryan for a second and suddenly remember exactly where we all are. I slump back in my seat and look tentatively out the window. “I think this is going to be . . . interesting,” I whisper, my words dripping with trepidation. Poor Professor Francis. They’re not listening at all. This whole crazy ruckus is obviously contagious. I seem to be the only one who is immune. Even the usually reserved Bit is getting overly excited. I can tell by the bug-eyed way she’s staring so intently at her computer slate. “Shhh. Keep it down, will ya?” I hiss at her. My stomach twists and turns even more than before. to me, and that she probably knows more about him from TV inter- views and e-mag articles than I do. I’m not sure why, maybe it’s self- preservation, but I choose to lie instead. “Well, one time on my birthday we went horse riding and had a picnic by the lake. We took a boat out and he taught me how to fish.” I’m such a terrible liar, but Bit doesn’t seem to notice at all. “Wow. It’s so hard to imagine him doing father and daughter stuff like that, y’know, normal dad-type stuff,” Bit says, gazing thoughtfully out the window. “I know. Hard to believe, right?” I say the words with the same thinly veiled sarcastic tone as before. That seems to go right over her head as well. Professor Francis is at his wits’ end. People are chattering, texting madly, and snapping pictures out the windows. Miss Cole is just sitting there, smiling like an idiot, so she’s no help at all. Brody Sharp begins chanting, “Move that bus, move that bus!” which, since we’re already parked, makes no sense at all, but it isn’t very long before others join in. It’s ridiculous. Out of the corner of my eye I see Ryan Forrester, who until now was quietly reading, lean over the aisle toward Margaux. She leans toward him, flicking her silky blonde hair and beaming her perfect white teeth, her huge, pale-blue eyes flashing beneath her fluttering eyelids. Millie strokes her auburn hair behind her ear, raises one eye- brow, and gives a knowing look to Miss Cole, who smiles back before promptly shifting her gaze hungrily to Ryan’s lips. Brent Fairchild spots the exchange and sits up in his seat like a meerkat. That is his kinda-girlfriend Ryan’s talking to, after all. Ryan says something to Margaux that I can’t hear above the chatter, and she nods. Suddenly she stands and shouts, “Everybody shut up!” The bus immediately goes silent. Not only for the fact that she thinks she’s the queen bee of this school, but also, and especially, because everyone else seems to think so, too. Apparently even Ryan Forrester. I tell myself that it shouldn’t bother me, but it really does. I’m halfway through a thought about how stupid he must be when he catches me looking at him. He smiles a crooked smile and holds our connection for that millisecond lon- ger than necessary, that minuscule amount of time that, in an instant, makes you both realize that it’s more than just a look. My eyes widen, my stomach tightens, and I quickly turn away. Totally busted. I quickly flump back against the seat. “Hells yeah!” Dean McCarthy shouts from the back. 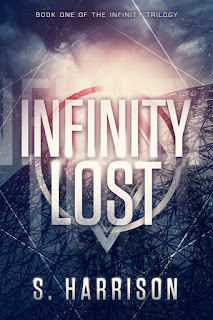 Excerpt from Infinity Lost by S. Harrison, on-sale November 1, 2015. 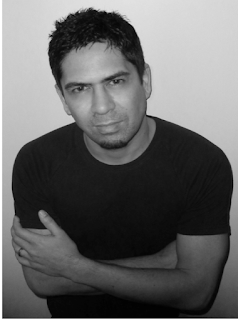 Published by Skyscape, an imprint of Amazon Publishing. Copyright © 2015 S. Harrison. S. Harrison is an author from New Zealand, where he often indulges in his love of watching superhero m ovies and art house films. He frequently escapes to the many islands of the South Pacific, where he is hard at work on his writing. Infinity Lost is his first novel.